Back by popular demand, the 2016 National Biodiesel Conference once again featured a panel of former Congressional representatives to talk about renewable fuels policy and in this election year, presidential politics as well. 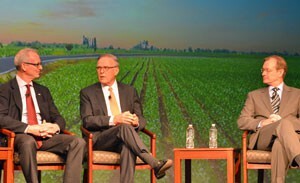 The panel featured former Republican Congressman Bob Inglis of South Carolina, who spoke at the first general session this week; former Democratic Senator Byron Dorgan of North Dakota, and former Republican Congressman Kenny Hulshof of Missouri. All of the panelists expressed grave concerns about candidates’ abilities to run this country. “I think my party will either choose well or choose its destruction,” said Inglis. As a Democrat, Dorgan said he was worried about both political parties. “All this (the campaign) is very clever and funny but this is really serious business, we’re talking about the future of this country,” he said. When it came to policy issues for biodiesel, all of the panelists expressed their support for the Renewable Fuel Standard (RFS) and for a producers tax credit.